What is Woodrow Wilson most known for? Woodrow Wilson was president during World War I. He also helped to form the League of Nations after the war. Wilson grew up the son of the preacher in the southern states of Georgia, North Carolina, and Virginia. As a child he struggled with schoolwork due to dyslexia. He persevered, however, and eventually became an excellent academic. He went to the College of New Jersey (Princeton University) and got a degree in history. Wilson moved about attending graduate school at a few different universities including studying law at the University of Virginia. He passed the bar exam in 1882 and practiced law for a short time, but he did not enjoy being a lawyer. He ended up going back to Princeton to work as a political science professor. A good portion of Wilson's career was spent working for the university. He taught for over fifteen years and then worked as president of Princeton University for another eight years. Wilson had a great interest in government. He wrote many papers on how he thought government should work. Eventually his career took him into politics and government service. In 1911 he became governor of New Jersey. He was a popular governor and soon he was being asked to run for president. Wilson became President of the United States in 1913 after defeating both current president William Howard Taft and former president Theodore Roosevelt in the election. He immediately set about putting some of his ideas that he had studied for years as a professor to work in the U.S. government. Federal Reserve System - This system is still in place today and helps to regulate the economy by controlling the money supply. Federal Trade Commission - Wilson put this commission in place to keep business practices fair for all. Changed the tax System - He implemented a graduated tax system. This meant that people who made less money would pay taxes at a lower rate than the rich. This system is still used today. A year after Woodrow became president World War I broke out in Europe. After growing up in the South during the American Civil War, Wilson hated war and wanted to keep the U.S. out of World War I. He managed to do this for the rest of his first term and won a second term as president with a campaign based on "He kept us out of war". However, soon after the election, Germany began to sink U.S. ships traveling to Britain. The U.S. had no choice but to join the war. Wilson called World War I the "war to end all wars". He said the U.S. must fight because "The world must be made safe for democracy". On January 8, 1918 Wilson gave a speech about the war. In this speech he outlined fourteen points or goals that the United States had in World War I. These included such items as freedom of the seas, reduction in arms, and the restoration of Belgium. On November 11, 1918 World War I came to an end. 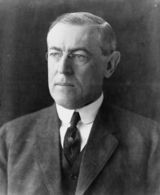 President Wilson took a major role in influencing the treaty. He had the idea for a League of Nations. This would be a group of countries that helped to negotiate disputes and try to keep peace in the world. He won the Nobel Peace Prize in 1919 for his efforts with the League of Nations. Wilson had struggled with his health for years. In 1919, while he was still president, he suffered a major stroke. He was very sick for the rest of his life and died in 1924. His earliest memory as a child was hearing that Abraham Lincoln had been elected president and that war was coming. He was the first president to visit Europe while still in office. Wilson was buried at the Washington National Cathedral. He is the only president buried in Washington D.C.
His full name is Thomas Woodrow Wilson. His face is on the $100,000 dollar bill. He was married twice. His first wife Ellen died while he was president and he married his second wife, Edith, while in office.